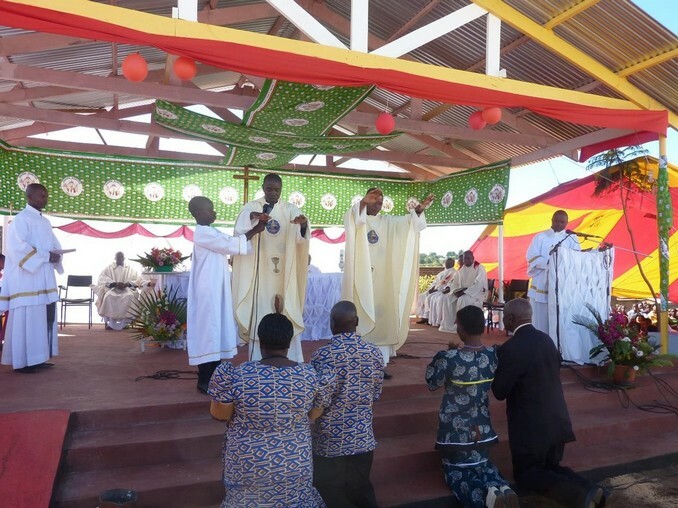 THYOLO, Malawi - On 18th June 2016 Deacons Anthony Daniel Chilolo, smm and Peter Alinafe Makina, smm were ordained as priests at Mvumbwe parish by His Grace archbishop Thomas Msusa, smm, archbishop of Blantyre. The colorful ordination Mass began with the blessing of a grotto dedicated to Our Lady. The parish was also celebrating its patron saints, the Ugandan martyrs. The function attracted hundreds of people from all corners of Malawi particularly the parishioners of the hosting parish led by Fr Jacob Otieno Ombidi, smm as its parish priest. In his speech, Fr Felix Mabvuto Phiri, smm, Superior Delegate congratulated the newly ordained priests and assigned them to serve in the following communities: Fr Anthony to serve at St Louis Montfort - Balaka parish while Fr. Makina, to be in Nantipwiri community. Fr Anthony Daniel Chilolo, smm was born on 3rd March 1985 at Mulura Village T/A Genela, Phalombe. He hails from Phalombe parish, archdiocese of Blantyre. His motto is “You must increase, but I must decrease” (John 3:30). Fr. Peter Alinafe Makina, smm was born on 2nd December 1984 at Kachingwe village T/A Chikowi zomba. He is from Magomero Parish, Zomba Diocese. Fr Peter’s motto is "Lord, to whom shall we go? You have words of eternal life" (John 6: 68). Both Fathers were ordained deacons on 12th December, 2015 at St Louis Montfort Parish Balaka and made their Perpetual Profession on 11th December, 2015 at Montfort Media Chapel. I extend my congratulations to the newly ordained Frs Anthony and Peter, SMM. I am a former Montfortian seminarian and novice here in England. I am a very close friend of Fr Charlie Beirne. I also know Frs Felix, Jacob and along with Fr Francis, now in Uganda, I think. I helped the above Felix, Jacob and Francis in August, 2007 and May/June, 2008 as part of their formation when they were novices in Nsikye, Mbarara, Uganda. As you may see above, I have my own charitable website, but now that Charlie is in Sitima, I want to increase and extend my website to very much include Malawi. I look forward to whoever may want to communicate with me. Pat - North East England.